Rise of The Planet of The Apes is A Howling Good Time On Blu-ray. "Rise Of The Planet Of The Apes" on the surface appears to be a "throw away" summer film, a haphazardly thrown together money grab, grasping at nostalgia for its acclaimed predecessor. Much like its storied roots, however the film will shock and awe with it's stunning plot twits and revelations only adding to the mythos of The Planet Of The Apes. Rise of The Planet of The Apes starring James Franco (Spider-man, 127 Hours) directed by Rupert Wyatt (The Escapist) is a prequel of sorts to the original 1968 Plant of The Apes film. Instead of showing the future and how Apes have taken over our planet, Rise of The Planet of the Apes takes place in our time and portrays the events that led to the "Ape" takeover. Will Rodman (Franco) a scientist at Gen-Sys, a biotech company that has been trying to develop a cure for Alzheimer's disease and is currently testing the new cure on chimpanzee in his lab. After a mishap in the lab the project is shut down and in the chaos Will takes home one of the labs baby chimpanzees, Caesar (Andy Serkis). Inheriting an unparalleled intelligence from his mother and Will's research Caesar appears is a marvel of modern science. However, he soon finds that the world is not as ready to accept him as he thought they would be. Aside from becoming the first "apes" film to take place in modern day society Rise of the Planet of the Apes also has the distinct honor of being the first "apes" film to be rely entirely on computer generated apes. All apes in the film where created using motion capture including a brand new technique by Peter Jackson's WETA studio that allows for motion capture to be created outside in the "real world" other than just on a soundstage. This led to amazing, stellar performances by the apes in the film, unlike anything ever seen in the series. As expected with most modern day films the Blu-ray release of Rise of The Planet of the Apes boasts an amazing picture quality with a sound mix that is equally impressive with just the right balance for dialog and action that does not make you mute your speakers for every load crash that is on the film. The disc includes the traditional making-of featureette, deleted and additional scenes, a digital copy of the film which thankfully is not the new Ultraviolet system and will play properly on your AppleTV system. Whether you are a return visitor to the Planet of The Apes series or a new convert. This film is most definitely the right place to start. 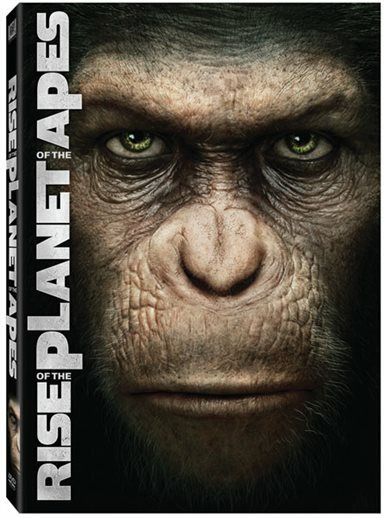 Download Rise of the Planet of the Apes from the iTunes Store in Digial HD. For more information about Rise of the Planet of the Apes visit the FlickDirect Movie Database.